One of the advantages of purchasing a Dragon Strand cage is that it is rust proof and the screen cages can be used outdoors. The cages are designed to keep both chameleons and their feeders in the cage, but if you are using the cages outdoors it is a shame to keep naturally occurring diurnal insects from making their way into your cage and providing a nutritious meal. 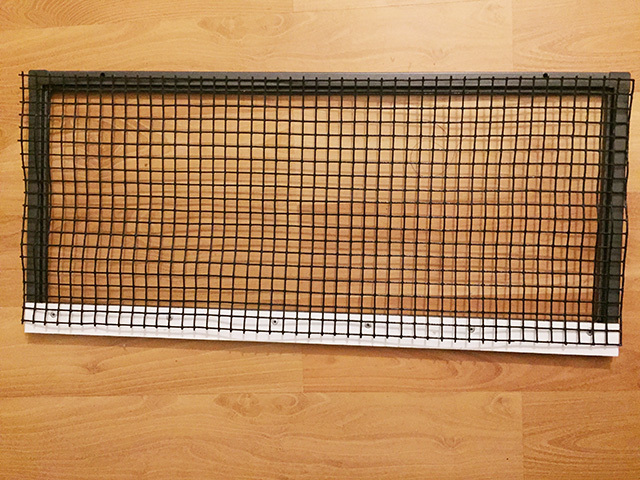 In this application note I describe a cage modification that will modify a Dragon Strand screen “Keeper” series cage to allow flying insects in the cage. 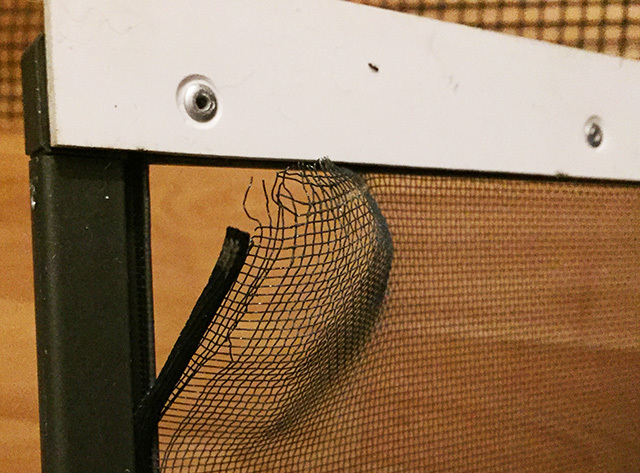 We will replace the top face panel of a Dragon Strand Large Keeper Kit cage with a ½” square hardware mesh. Yes, there is a cage hiding under all of that! 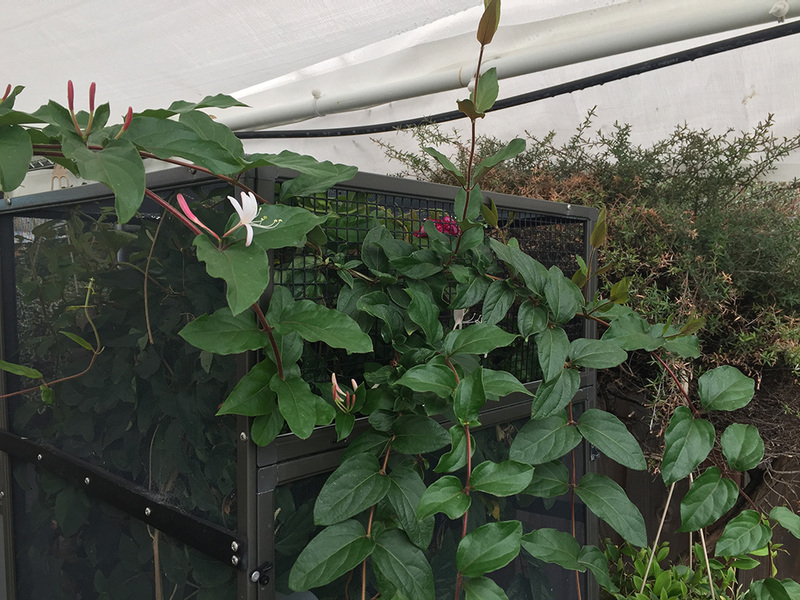 One of the best parts of letting the insects in is that the plants can now get out and the unnatural shape fo the cage is obscured. First of all, when using a cage for in an outdoor application there are many things necessary to do it safely. 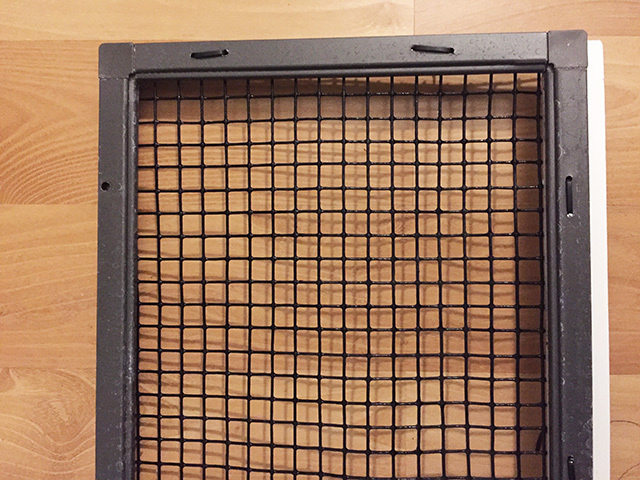 Only use screen cages as solid side cages will trap heat and can kill your chameleon. 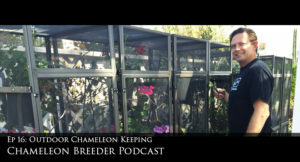 If you are considering putting your chameleon outdoors and would like information on how to do it safely please listen to this episode of the Chameleon Breeder Podcast. Second, providing an entry for flies, bees, praying mantises, and butterflies does no good unless they have a reason to use it. 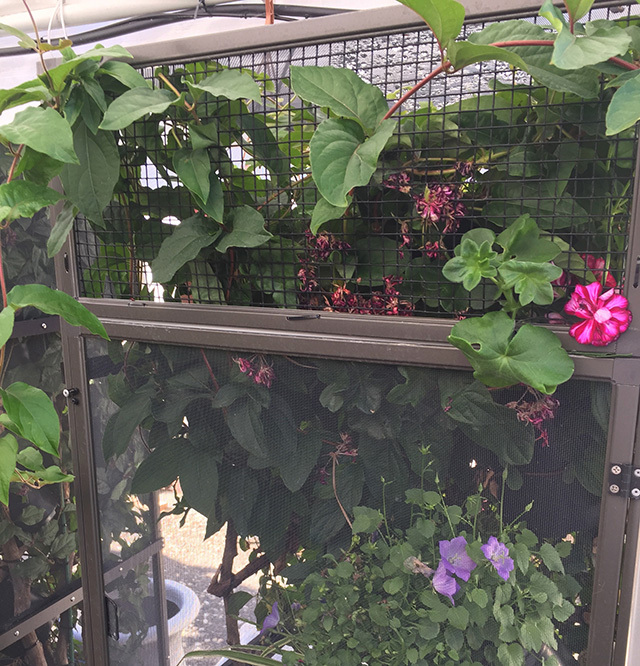 Therefore, choose your cage plants to be varieties the produce flowers or make sure there is some bait to encourage them to come. 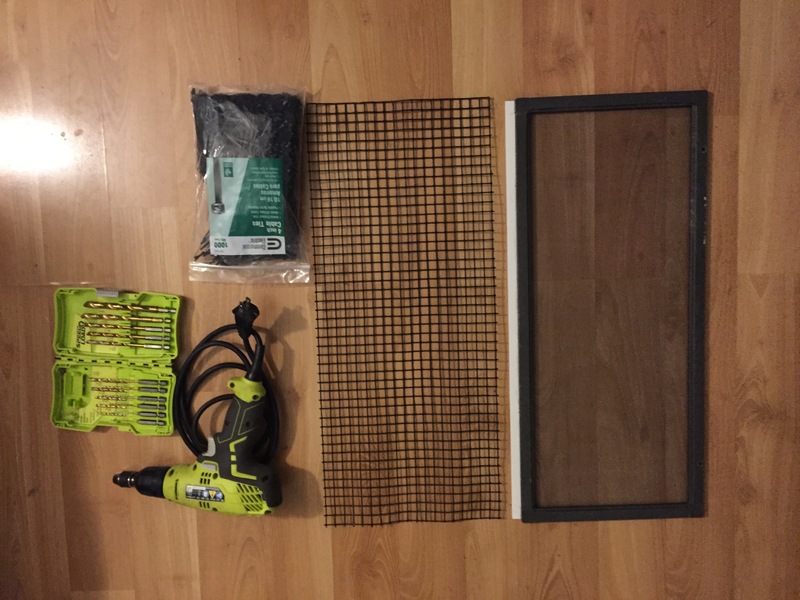 Summary: To provide inside access to flying insects we will remove the screen on the Top Face Panel and replace it with 1/2” PVC coated hardware mesh. 2) Remove the screen by finding the end of the spline holding it in and pulling it up. The spline end will be protected by the white PVC strip. Find this end, pry it up, and then the rest should unravel easily. When screen is fully removed. 3) Cut a length of Hardware cloth to match the frame. It needs to overlap the entire width and height of the screen panel frame. It is not necessary to have overlap to the end of the strip of white PVC. It will not hurt, but we will only use the frame portion that the PVC is attached. Make sure the shape you cut of the hardware cloth is as close to the size of the panel as possible. 4) Drill holes in the frame to be able to insert zip ties to hold the hardware cloth in place. Select a drill bit that is the width of the zip ties you are using. I am using 4” black zip ties and a 1/8” drill bit is the perfect size. I use clamps to hold the hardware cloth in place while I drill holes. You may do this by hand instead. It is just a littlemore work to get it right. Drill holes so the zip tie will hold a ‘square” of the hardware cloth tightly. On the bottom edge with the PVC strip, make sure you drill into the frame. Although the PVC alone will be string enough, we need the other side to be flush for the door to rest against. 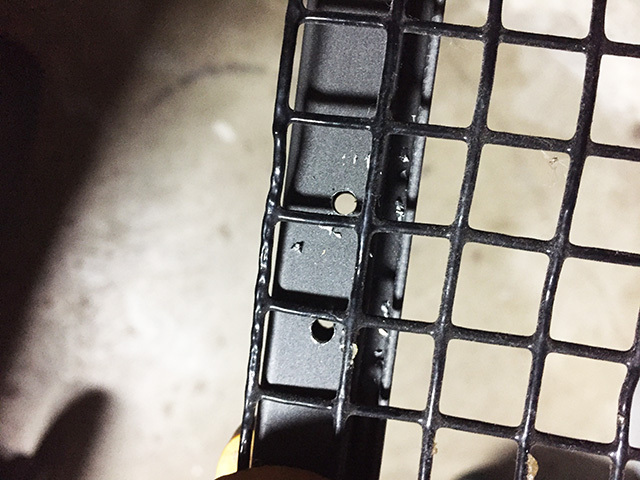 Remove burrs from the holes drilled in the aluminum framing. Do not drill holes on the top frame piece. This piece will be screwed into the top panel of the cage. 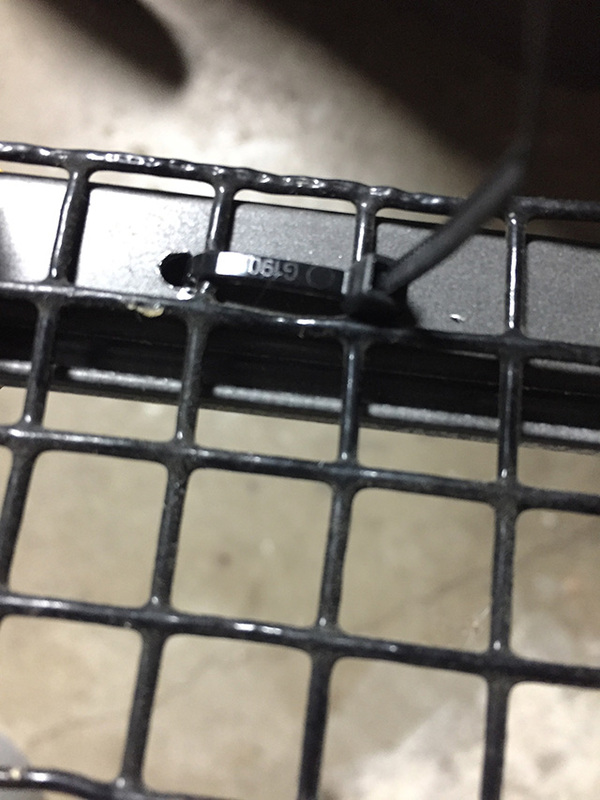 You do not want the zip tie to block this and create extra space between the frame pieces. 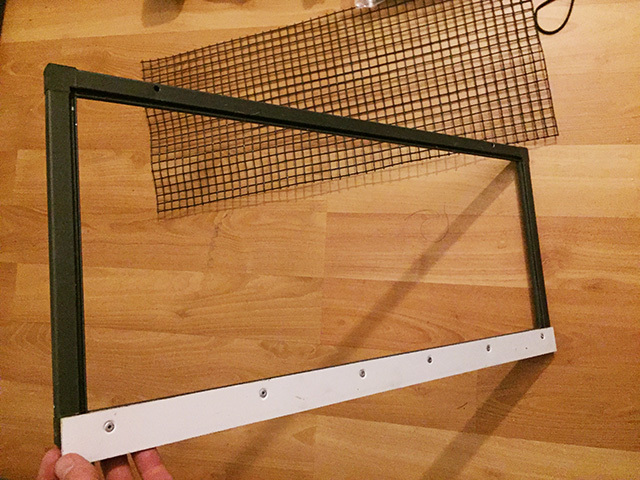 Screwing the frame into the top panel will sandwich the entire frame length and no further attachment of the hardware cloth is necessary. When drilling your holes take advantage of the structure of the hardware cloth and drill close to the squares. Your work will be subtle when looking from the outside of the cage. Note that there are no zip ties on the top frame piece or in the white PVC strip below the bottom frame. The tighter the zip ties the firmer in place the hardware cloth. 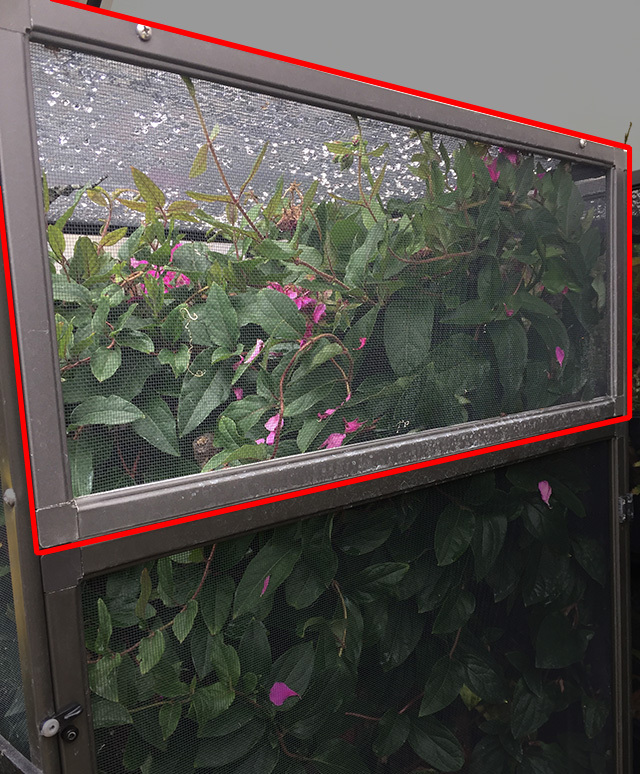 Conclusion: this modification will not only allow natural insects entry to the cage, but flowering plants and vines an exit point to grow out of, break up the unnatural lines of your cage and create a more beautiful environment for both you and your chameleon.